Posted by Lauren Ruby on Sunday, February 10, 2019 in College Life, Food, General Information. At Vanderbilt, you get 3 meals/day your first year and then it decreases to 2 meals/day as the default meal plan for your second year with the option to modify it to your liking. If you only have 2 meals/day like me, it’s important to use your meals wisely. 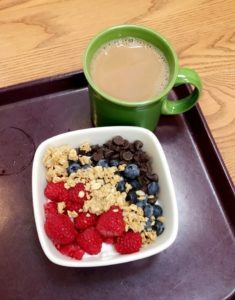 Here are my breakfast, lunch, and, dinner favorites on-campus! Each swipe, you get to choose an entree and usually three sides but it varies by location. My customized yogurt parfait from Commons! The great thing about Bronson is it is all-you-can-eat style!